The state-wide shutdown declared by Sabarimala Action Council, with support from Rashtriya Swayamsevak Sangh (RSS) and Bharatiya Janata Party (BJP) in Kerala on Thursday, turned violent in various parts of the State. The protest, which followed after two women aged below 50 years entered the Sabarimala temple despite resistance from the Hindu outfits on Wednesday, has ended up in violence across the State and death of a BJP worker. The devotees believe that women between the age of 10 and 50 should not visit the temple and a recent Supreme Court order permitting the women to visit the hill temple triggered protest from the believers. The Hindu outfits, supported by BJP and RSS, have supported the protest, while the Communist Part of India (Marxist)-led Left Democratic Front (LDF) government vowed that it would facilitate women to visit the temple to abide with the Order. With traders under the banner of Kerala Vyapari Vyavasayi Ekopana Samithi (KVVES) deciding to open the retail outlets in defiance of the hartal, the protest turned violent in many parts of the State including Kochi and Kozhikode. The traders, who requested police protection for their smooth operations, alleged that the law enforers failed to shield them in many places. Several protestors were injured in police lathi charge. Reports say that at least 745 people were arrested till Thursday evening, while 628 people were taken on custody as a precaution. The government transport system has claimed a loss of around Rs 3.35 crore as the protestors attacked around 100 buses in two days. The annual loss due to the attacks in Hartals for the transport corporation is around Rs 10 crore, said officials. State Chief Minister Pinarayi Vijayan on Thursday said that the ruling party offices, media persons and some of the shops were also attacked by the protestors. 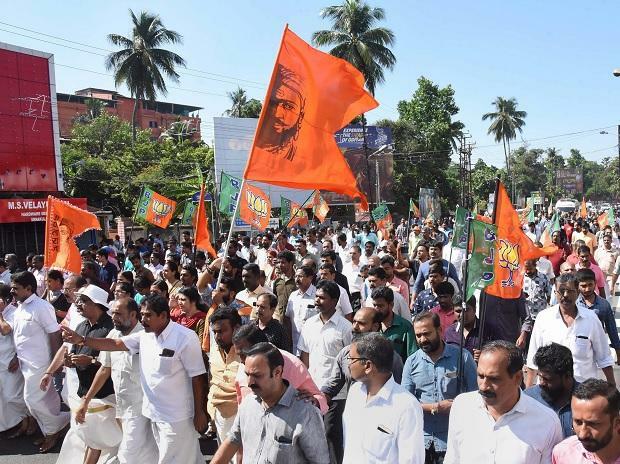 He said that the government will continue to provide support to women who want to visit the Sabarimala temple, to comply with the Supreme Court Order and alleged that the BJP is trying to instigate violence in the State. The congress party and its alliance are also hand in hand with the BJP in the State, he alleged. The violence started after two women -- A Bindu (42) and Kanaka Durga (44) -- entered the temple on Wednesday early morning, following which the priest closed the temple for over an hour and conducted some rituals in a so-called purification exercise. The BJP and Congress leaders alleged that the entry of the two women, who are allegedly affiliated to a leftist outfit, was orchestrated and managed by the ruling party. Vijayan refuted the allegation and said that he was not aware who the women were till it was reported by the media.